There is something inherently delicious about deep fried food. Any food that has been deep fried in oil is bound to have the taste factor. The oil has a tendency to not just coat the food enhancing its taste along the way but also coat the palate with delectable memories that leave one asking for more. I love deep fried food as well and do indulge in it once in a way but unfortunately my constitution does not permit me to savour deep fried foods as often as I want. I always regretted this part of my life which forbade me to eat my favourite deep fried foods as much as I wanted to and as many times as I needed to. This was until I came up with the perfect solution. Baking my pakoras or pakodas means that I can eat to my heart’s content without any regret. And when I posted a picture of my baked pakoras on my facebook page and instagram account, there were many recipe requests for the same. And this also happened to be the perfect post to make as a follow up to my previous posts of red and green chunteys. Pakoras or pakodas as they are known in India are deep fried vegetable fritters usually made with seasonal vegetables of choice with a gram flour (besan) covering. And they are especially enjoyed during the monsoons with a hot cup of chai or tea. 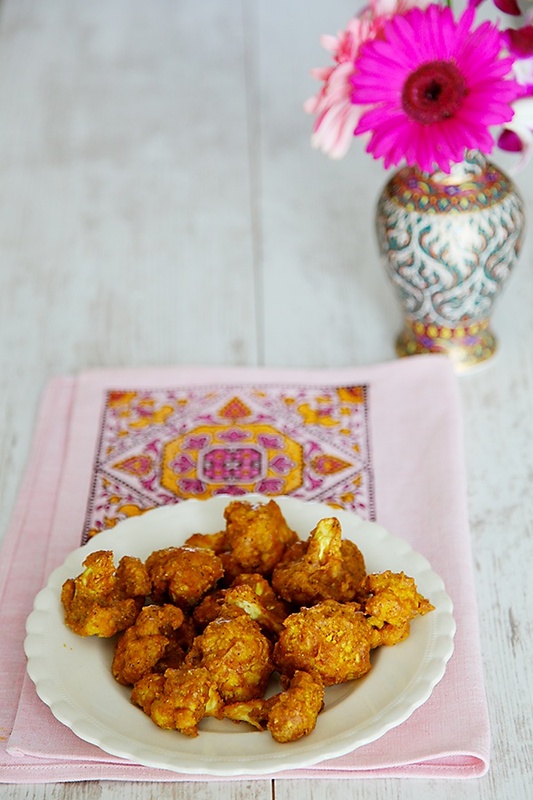 The rains are on their way out in India and these pakoras seemed to be the perfect way to make way for the new season. 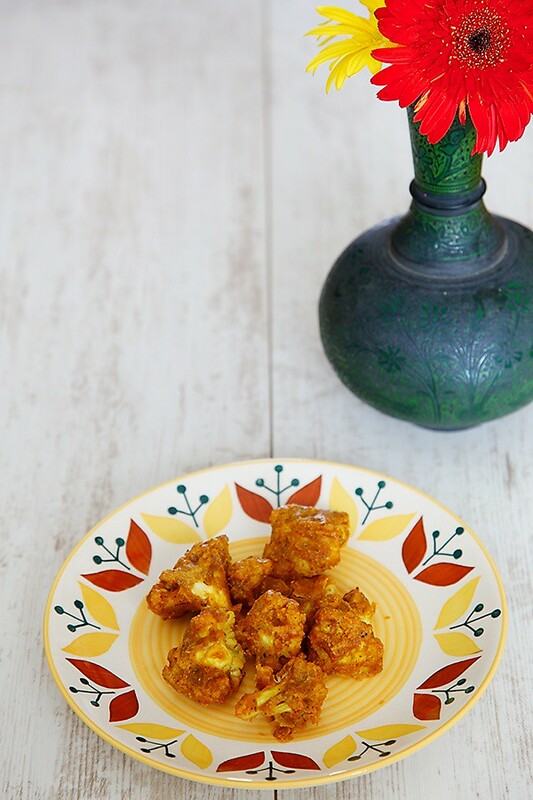 Coated with a batter of a spiced gramflour mixture and baked instead of deep fried, these pakoras allow me to relish the satisfaction of eating a pakora without any fear of the side effects of eating deep fried food. And when mixed with this red or this green chutney, the taste is both elevated and enhanced making it delicious and healthy. If you are looking for an exact replica of the original deep fried version in this baked version, this may not fit the bill. But, if you are looking for a healthy yet delicious alternative to deep fried pakoras then rest assured that you are completely taken care of. A rainy day when friends come calling, a snack to serve in a party or an accompaniment to lunch or dinner, these pakoras are fabulous for all these occasions. 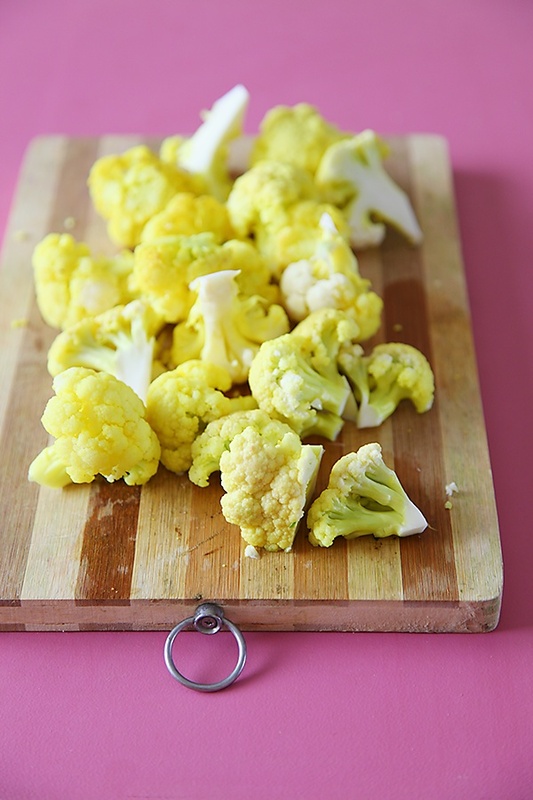 You could also use broccoli florets instead of cauliflower. The spice quotient can be increased or decreased based on personal preference. 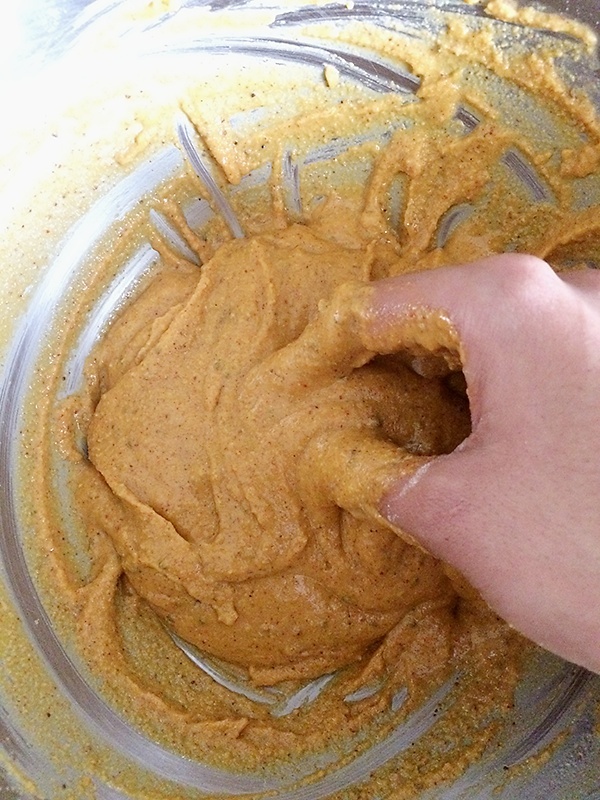 In a large bowl, put in the 1 tsp turmeric powder and 2 tsp salt. Pour boiling water over it and immerse the cauliflower head in the water, stem side up. Leave it in there for about 10 to 15 minutes. This will clean the cauliflower of all the dirt, grime and pesticide if any and also partially cook the cauliflower. 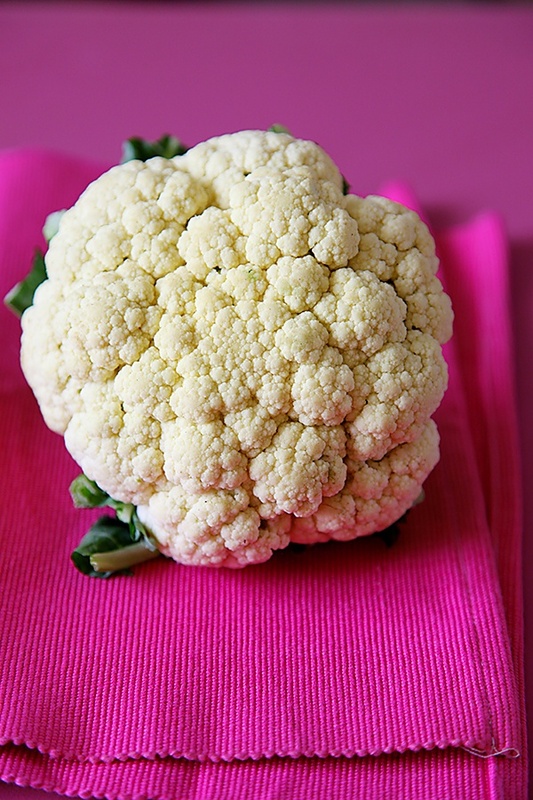 After the cauliflower is soaked, take it out of the water and allow to cool a little and then carefully separate the cauliflower head into florets of your desired size. Make sure you don’t keep them too big or too small. In a clean dry bowl, put in the gram flour and over it the red chili powder, turmeric powder, garam masala powder, coriander powder, carom seeds and salt. Mix all the dry ingredients together. Pre heat the oven to 200 C/400F. If using ghee, heat it until it melts and is hot but do not allow it to smoke. 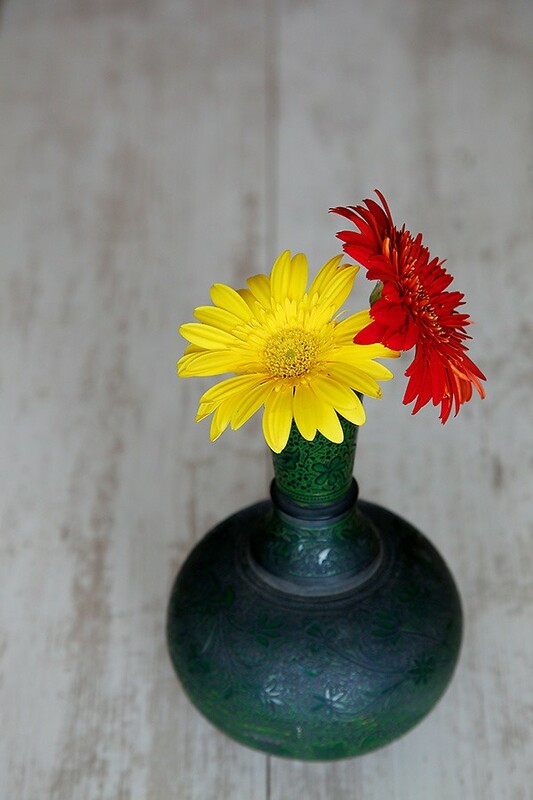 If using vegetable oil, heat it as well but do not allow it to smoke too. Next add in the melted ghee or vegetable oil and mix until the mixture resembles coarse crumbs. Stir in the ice cold water and mix well. Finally put in the juice of a lime and mix until the batter is smooth without any lumps. Now coat the cauliflower pieces with the batter and bake in the centre of the oven for about 20 to 25 minutes. Serve hot or warm with the chutney or sauce of your preference. anees: Have made the required changes. Thanks. That's a brilliant idea to have pakoras, but baked to reduce the calorie intake. This recipe is noted in my to try list. I am hosting a diwali event, please do participate.Thanks. I like the idea of baking instead of frying. Thanks for sharing. Mayuri: Hope you like it. Sadhna: I love this idea as well! Pratiba: Fried food plays havoc on my skin and immune system. Wish I could indulge in it more often though. 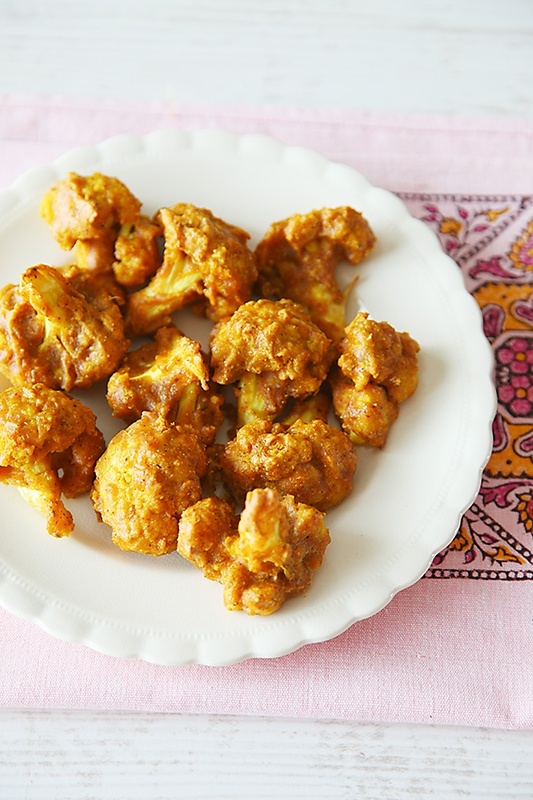 But this recipe will allow us the luxury of eating a pakora. Hope you will like it as well. I have a request for a recipe for you. Do you have a recipe for eggless raised [ deep fried, not baked ]donuts. Thanks. Dhanyawada Anu. Krispy kreme andhre nanage thumba ishta. Well, about this recipe.. I am not that fond of besan.. would you please suggest any other option? Megha: You could try using a mixture of different flours like whole wheat flour and rice flour. 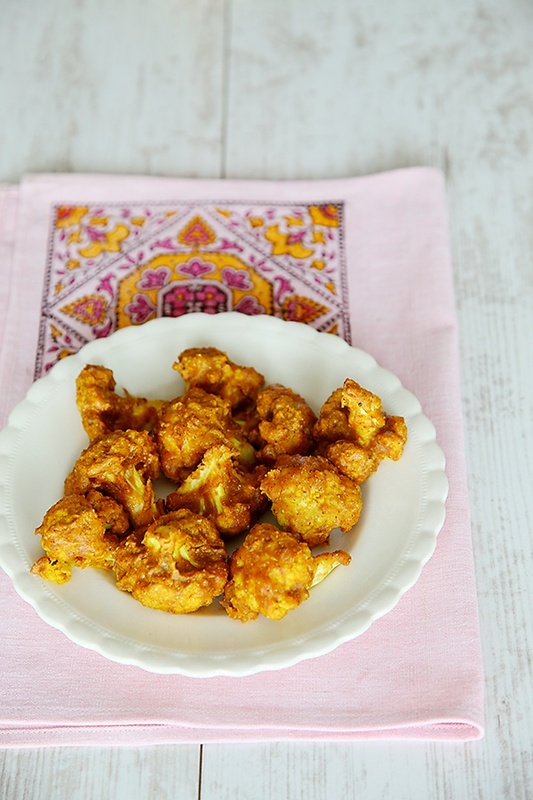 Cauliflower Pakoras are such an variation to the normal french fries provided as appetizers or snacks.. Great recipe. I tried this recipe yesterday to add to my Punjabi Kadhi and for once the pakode/fritters overpowered the taste of the Kadhi! We loved it! It was so easy to make and I put a few in a roti with some avocado for a healthy and filling lunch 🙂 thank you for the recipe. I wanted to know, if I were to deep/shallow fry can I use the exact measurements for the batter? Bindi- You made good use of these pakodas by putting them in a kadhi. 🙂 Yes you can use the same measurements to deep fry! Hi, i love this and have made it twice. My question is, do yours come out crispy? Mine don't…. Sara- Brush the pakoras with oil to make them crispy.